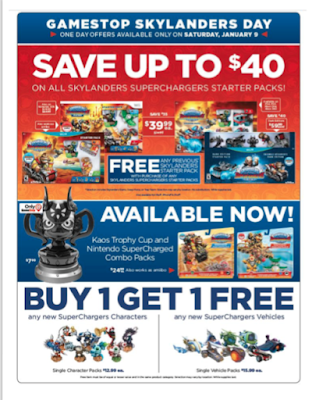 Skylanders SuperChargers is making sure to bring in the new year with a bang. Tomorrow Saturday, January 9th at participating Game Stop locations nationwide (make sure to check if your local Game Stop is participating), they will have some amazing BOGO deals going on. You can pick up a Skylanders SuperChargers starter pack for only $39.99 or 59.99 for the Dark Edition, and receive an additional Skylanders starter pack from a previous game (Skylanders Swap Force, Skylanders Trap Team, and Skylanders Giants) for FREE! 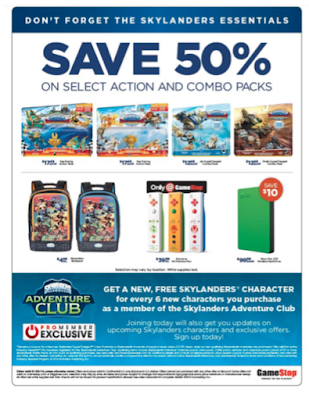 Just take a look at the flyer pic above, there will be some great deals. Get your kids and wallet ready for lots of shopping tomorrow.